Description: This Coolmore Stock and Dairy Farm invoice measures 8 1/2 by 4 1/2 inches. The account on the invoice belonged to Captain John F. Divine of Wilmington and shows a balance of $35.20 for butter, charged between January and May 1898. History: The Historic Wilmington Foundation donated a collection of 37 documents found in the Lazarus-Divine House to the Museum in 1989. The collection contains a variety of personal financial records relating to the Divine household, including bills for water services, wall papering services, and various materials; receipts from the Cape Fear Club, R.A. Montgomery Grocery, and James D. Nutt Pharmacy; as well as a checkbook and processed bank checks from The Murchison National Bank. 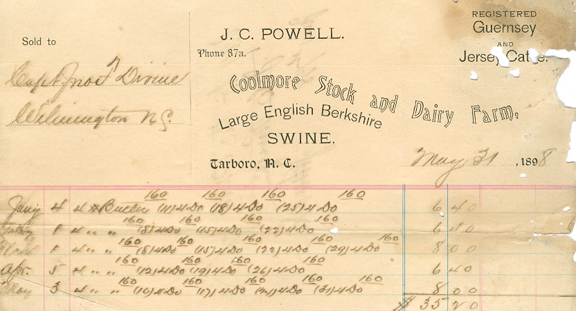 This dairy statement was among these papers and is from J. C. Powell of the Coolmore Stock and Dairy Farm. The Coolmore Plantation is located just outside of Tarboro, N.C., and was constructed between 1858 and 1860 for Dr. Joseph John Willis Powell (1807-1861) and his wife Martha B. Whitaker (1820-1892). Powell was a wealthy cotton planter and physician. The main house’s elaborate design includes curved fresco walls painted by Russian-born artist Ernst Dreyer. The Coolmore house is considered to be Dreyer’s masterpiece. This house also has the distinction of being the first in Edgecombe County to have gas lights. With the deaths of the Powells’ two older sons, Richard Harrison and Henry Whitaker Powell in the Civil War, the plantation was inherited by youngest son Joseph Clay Powell (1857-1909). John Francis Divine (1830-1906) was born in Glasgow, Scotland, but came to America sometime before the Civil War. Mr. Divine served in the Confederate Army as a quartermaster and was promoted to captain in the 27th Regiment Co. A of the N.C. Infantry stationed at Fort Macon. He came to Wilmington in 1865 as a master machinist for the Wilmington & Weldon Railroad. In 1874, Divine and his wife, Augusta Elizabeth Howle (1932-1906), purchased the Lazarus House located at 314 Mulberry Street. Mulberry was changed to Grace Street around 1897. This home, built around 1814, was originally owned by a wealthy, local merchant, Aaron Marks Lazarus (1774-1841). During his time in Wilmington, Capt. Divine worked as the superintendent of the Wilmington & Weldon Railroad and the president of Clarendon Water Works. He also served as a city alderman. The Divines made improvements to their house in 1885 and lived there until their deaths in the early 1900s. Both are buried in Oakdale Cemetery. In 1922, Morrison W. Divine sold the Lazarus-Divine House to H.F. Wilder, who converted it into the Wilder Apartments. These apartments were vacated during the late 1940s and the house fell into disrepair. The Historic Wilmington Foundation purchased the house in 1976 to save it from demolition. In 1984, the house was purchased by the Andersons who spent several years restoring and renovating it into four apartments.